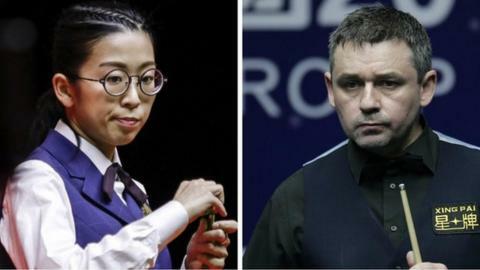 Alan McManus will treat Ng On-yee "like any other very good snooker player" when he faces the world's top woman in the World Championship qualifiers on Friday. Two-time semi-finalist McManus has never faced a woman as a professional. "I've been a pro nearly 30 years and the last time I played against a lady player in a tournament was in my amateur days," he told BBC Scotland. "There were a couple of good players then. It won't affect me." Hong Kong-based Ng has won the World Women's Snooker Championship two years running and is one of two females in this year's qualifiers, which start on Wednesday, along with England's Reanne Evans. Eleven-time women's champion Evans faces a first qualifying round meeting with Zhang Yong. "Reanne Evans has been the best player for going on 15 years," 48-year-old Scotsman McManus said. "I've just always seen Reenie as just a very good snooker player. "I think it's difficult for the lady players, especially Reenie in the last decade. She's been too good for one tour and maybe not quite good enough for the other. "But she's played in the World Championships a few times and she nearly beat Ken Doherty a few years ago but lost 10-8." McManus, who reached the quarter-finals of last week's China Open, has yet to see 28-year-old Ng play but is expecting a tough match. "I think what she's been doing is playing in a couple of the academies in Asia, which are really thriving in the last few years and she's been able to thrive through that," he said. "It is going to be first to 10 and you just want a good start to stamp your authority early on. "I had a good result in China recently, but the three qualifying rounds are always a minefield." Fellow Scot Graeme Dott, the 2006 world champion, starts his qualification campaign against Pakistan's Hamza Akbar, with Anthony McGill facing England's Ashley Hugill. Four-time world champion John Higgins is seeded fifth for the tournament at the Crucible in Sheffield, with fellow Scot Stephen Maguire 15th.